Passionate about Israel and LGBTQ rights? A Wider Bridge is seeking undergraduate or graduate students to intern at our New York and Los Angeles offices. The ideal candidate is committed to spending 16-20 hours a week, assisting the AWB team. We are seeking candidates for the remainder of the Spring Semester, Summer, and/or Fall Semester. Interns will receive a $1,000 stipend per semester. A Wider Bridge is only considering local candidates currently living in the NYC and LA metro areas at this time. Work with A Wider Bridge team to research and prospect potential A Wider Bridge supporters, community partners, and future trip participants. Work with A Wider Bridge staff, lay leaders, and trip alumni to advance the organization’s mission in New York City/Los Angeles through planning community events. Organize and coordinate onsite event logistics with A Wider Bridge staff. Represent and network for A Wider Bridge at = partners’ events and programming in the LGBTQ, Jewish, and pro-Israel communities. 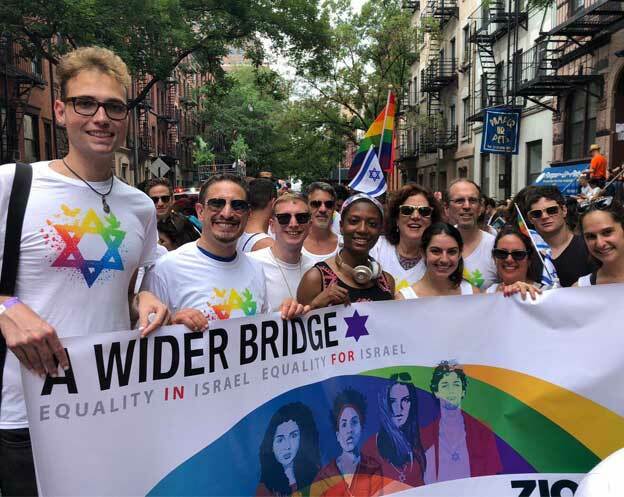 A Wider Bridge is the North American organization working through education, advocacy, relationship-building and grant-making to create equality in Israel by expanding LGBTQ inclusion in Israel, and equality for Israel by cultivating constructive engagement with Israel.